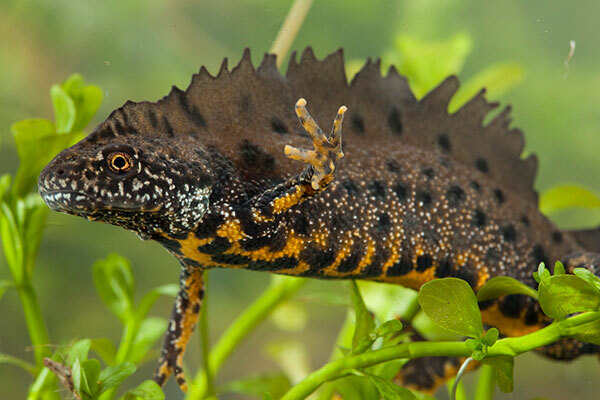 The great crested newt is fully protected under UK and European law due to its decline and vulnerability because of loss of breeding ponds and fragmentation of suitable terrestrial habitat. It is also listed as a priority species within the UK Biodiversity Action Plan. Capturing, disturbing, injuring and killing great crested newts are prohibited, as is damaging or destroying their breeding sites and resting places. The general guidance is that invasive work on breeding ponds is best done between 1 November to 31 January when the newts will generally still be hibernating on land and are unlikely to be present in the water. The dates are for guidance as specific dates cannot be given that will apply to all situations. Care also needs to be taken with work in the surrounding terrestrial habitat. Only suitably qualified and experienced people who are licenced by appropriate official bodies eg Natural England and Scottish Natural Heritage, are permitted to survey, handle and disturb great crested newts. Britain has probably Europe’s largest population of great crested newts and is, therefore, very important to their continuing survival. 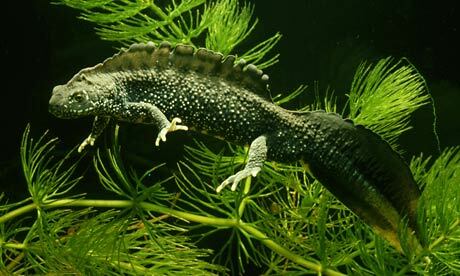 The great crested newt is the largest of the British newts, growing up to a maximum length of 17 cm. Both sexes have a dark brown warty body and yellowish-orange belly with black blotches, a warning to would be predators that they are poisonous to eat. Females tend to be larger than males. In the breeding season adult males develop a high, wavy crest along their backs and another along their tails. The tails have a silvery-blue stripe down the centre. Adult females do not have a crest and their tails are yellow-orange along the bottom edge. They need water-bodies such as ponds for breeding but for most of the year live on dry land. For breeding they prefer small to medium sized ponds that have some areas of clear, base-rich water, deeper than 30 cm and with few, if any, fish predators. Ponds lacking shade on the southern margin seem to be preferred. They do not require very high water quality. They also need aquatic vegetation for egg laying and appear to prefer extensively vegetated ponds with a submerged plant cover of about two thirds of the pond and emergent/floating vegetation of one quarter to one half of a pond: essentially, a well-established, mid-succession pond. Ideally there should be open, less vegetated areas within the pond to allow adult males to display in clear view of females. Great crested newts do not necessarily require permanent ponds, but the ponds should hold water until at least August in some years to allow successful metamorphosis. The periodic drying up of a pond may be beneficial since it controls predatory fish or invertebrates. Ponds need to support a good invertebrate population to provide food for developing larvae. The great crested newts often form meta-populations ie a series of sub-populations that are linked by dispersal of individual newts. They often inhabit ponds that are part of a ‘pond cluster’, and individuals move between ponds with varying frequency. Breeding occurs from around March to June. Females lay eggs individually on the leaves of aquatic plants near the edges of ponds. They fold the leaves to protect the eggs using their back legs, and can lay up to 200 eggs in a season. The adults then emerge onto land, spending the summer resting, foraging and dispersing before hibernating through the winter. The eggs hatch out after around two weeks, and larvae then take around 16 weeks to complete the metamorphosis at which time they leave the pond as juveniles (or efts) between July and October. They mature on land over two to three years. On land great crested newts prey on invertebrates, slugs, earthworms and soft bodied insects. In water they feed on other amphibian larvae, insects, dragonfly larvae and also the other species of newt. Larvae are highly predatory and cannibalistic, eating water fleas and each other. The newts hibernate from October to February, often amongst tree roots, in crevices, disused mammal burrows and amongst piles of stones and fallen or stacked wood, exploiting existing opportunities within the landscape rather than excavating their own sites. Adult newts emerge from hibernation around February depending on local climate and return to the water to breed, usually to the pond in which they were born. Their scientific name is Triturus cristatus.